Homepage. This page: Examples of car radiator blinds available to buy in the 1920s through to the 1960s. Even in fairly recent times, it wasn't unusual to see cars driven during the winter months, with either a piece of cardboard tied over part of a car's grille, or a piece of silver foil attached in some way, in part (or entirely..) blocking off the rush of icy air into the car's radiator. Up until the 1960s or so, this job could have been done in a much more stylish way, thanks to a variety of radiator blinds, or muffs, that were on the market. Cars, especially those in the pre-war days, often had large capacity cooling systems to keep engine temperatures in check, many engines still relying on the thermo-syphon principle rather than a mechanical waterpump, to circulate the coolant. In the summertime, super-efficient cooling was a handy thing to have, especially during bank holiday traffic jams when everyone headed off to the coast to dip their toes in the briney stuff. But come winter, there were definite benefits to be had by blanking off some of the surface area of the radiator. Engine wear would be reduced from start-up, the engine getting up to working temperature that much quicker than when a muff or rad blind wasn't used. This would also result in the choke being used less, saving petrol into the bargain. 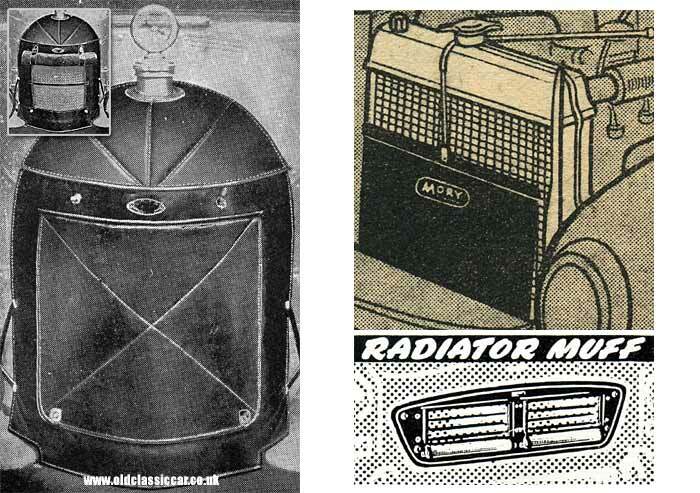 The first of the products shown on this page is the Duco radiator and bonnet muff, designed to fit the 'bullnose' Morris Oxford and Cowley motorcars, of the 1920s. The two images show the blind in use, covering the surface of the radiator and header tank in full, then rolled up exposing the radiator core to the breeze once the engine was up to working temperature. This type of radiator muff would continue on sale into the 1960s, with even late-ish classics such as Austin 1100s and Vauxhall Victors being able to sport these useful accessories, each muff designed to fit a particular make and model of car. If I could find one to suit my A40 Devon I'd be very tempted to buy it. The second image, top right, shows a different approach. The Mory Radblind was a rolling blind placed immediately ahead of the car's radiator, behind the front panel and out of sight when the bonnet was closed. Whereas the owner of a car wearing a radiator muff would need to hop out of his car to adjust the flow of air into the car's radiator, the Radblind user could adjust the airflow into the rad from the comfort of his or her driving position, thanks to a cable control. Early Volvo Amazons had a similar arrangement fitted as standard, operated from within the cabin by a slim chain arrangement. The final image above shows the type of rad blind available to car buyers in the 1960s. Accessory companies such as K-L sold products like this, various sections of the blind's surface could be opened or closed thanks to small lift-the-dot type fasteners. The photo below shows a typical radiator muff of the 1950s, fitted to an early Austin A30 saloon car. With the car's coolant rapidly getting up to temperature in the winter months, the next thing to look at might be an in-car heater, as many cars came without them as standard.